You must sign into your myHangout account in order to contact frailin. Introducing "Waterbound!" 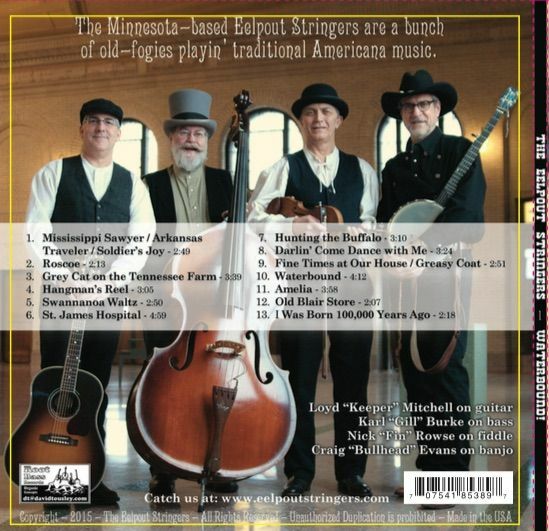 - The Eelpout Stringer's latest CD. It took us a while (4 years) but once we got around to it, it went pretty fast. Here's our newest CD - "Waterbound!" Got some fine old-time square dance chestnuts on here as well as a classic Doc Watson ballad (sung by Keeper, of course). There's a fiddle number written by Rayna Gellert and another waltz by my late fiddler friend, Debbie Sorensen-Boeh. While waxing nostalgic, we even included a 1960's New Christy Minstrels tribute ("I Was Born 100,000 Years Ago"). It's what turned me on to traditional music at the tender age of 8. My dad took me to hear 'em at Buena Vista College in Storm Lake, IA. 54 years later, that warm thought still gives me goose-bumps. Sound clips of all tracks are here or here. If you're interested, they're $15 (plus $2.50 S&H) at www.eelpoutstringers.com. Should have 'em back from the duplicator sometime late next week. Announcing "Waterbound! 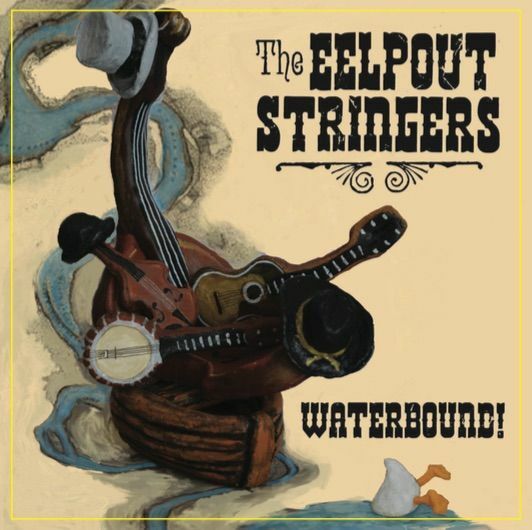 "- The Eelpout Stringers Next CD! It's o-fish-all... "Rockin' the Boat" launches! Bluegrass Americana Weekend - The MOVIE! The Best of Christmas Gifts. The Eelpout Stringers LIVE at the Harvest Festival! '08 MN State Fair Duets Competition. Woo-hoo! Autism Hangout is LIVE!! It's a-LIVE!! Singleton Street LIVE! Videos from 2/23/08 CD Release Concert. An Eelpout Stringers EXCELLENT ADVENTURE - Redux! The Dog Tales... a series of Banjo and Accordion Duets! Singleton Street Gospel - Order your CD here! "Wingin' It." A Singleton Street Gospel Recording Adventure! frailin has 4634 friends. View entire friends list. A Colin Vance "woodie" banjo. 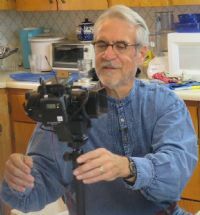 Occupation: Web publisher (Autism Hangout dotcom), writer, teacher and now, documentarian! Yee-ha! Right now I play 2 Chuck Lee Marble Falls, both with Bill Rickard tubaphone tone rings. I love sampling other banjos, but have settled on Chuck's for their consistent performance (legendary neck sensitivity) and sound. For 10 years I played "Old Time Gospel and Bluegrass" with a MPLS-based group called Singleton Street. We've recorded two CDs: "Wingin' It", our Gospel music and "Almost Live" our first CD. Got LOTs of influences. From Unca Dave Macon and Stringbean right up to several of today's performers (i.e. Dwight Diller, Mac Benford, Mark Schatz and Joe Newberry). My favorite of all time though, is "Old Wide Load"... Tommy Thompson of the Red Clay Ramblers. And someone here on the hangout that's incredible is frailblazer (Ric Hollander). Hi. My name is Craig Evans. I'm the guy that recorded the Banjo Builder and Old-time Performer Series. Banjo Hangout friend Brian Piddington called it my "Journey of the Heart." He was right. Over 4 years and 30k miles I met a group of wonderful human beings who - through their crafts - know they're making the world a better, more joyful place. Love these guys and gals and what they do! You will too. :) Update: 3/16 - I can now say the same about 48+ Old-time Performers (second 4 Volume 12 DVD documentary series). I rediscovered the wonderful world of old timey and bluegrass music at the age of 48. Where most of us heard many of these timeless tunes in our youth, few really knew what we were listening to. Aside from feeling like dancing to the joyful melodies, even fewer of us really appreciated the history of this incredible genre. The good news is, it's never too late! Through this music, I've had the good fortune of making new friends, rediscovering my youth... and experiencing incredible joy. I'm dedicated to sharing this music with others that they may come to appreciate the gift of old timey sounds.